It's a sure sign that summer's over and the awards season is around the corner - the feast of fall film festivals. 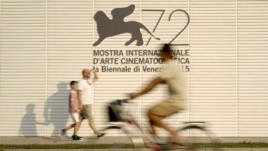 The 72nd Venice Film Festival opens Wednesday (September 2), followed later in September by movie extravaganzas in Toronto and New York. As well as celebrating the best of global cinema, the festivals battle one another to snag the biggest stars and hottest awards prospects. Venice, the oldest and stateliest of the bunch, brings 11 days of red carpets, flashbulbs, parties and premieres to the canal-crossed Italian city. Venice's opening slot has developed a formidable hit-making reputation. In 2013, it sent the space saga "Gravity'' into orbit and the film went on to win seven Academy Awards. Last year's opener, the midlife crisis comedy "Birdman,'' scooped up four Oscars, including one for Best Picture, and revived Michael Keaton's career. This year's festival opens with Baltasar Kormakur's thriller "Everest,'' which stars Jake Gyllenhaal, Robin Wright, Emily Watson and Jason Clarke in the fact-based story of peril on the world's highest mountain. Producers' hopes are as high as a Himalayan summit. Some of Hollywood's biggest names will be walking the red carpet on Venice's Lido island - and hoping it's a rehearsal for Oscar night. And last year's Venice hero, Keaten, returns alongside Mark Ruffalo and Stanley Tucci in Tom McCarthy's "Spotlight,'' about Boston Globe journalists investigating sexual abuse in the Catholic Church. Venice is offering up meaty fare from heavyweight global auteurs among the 21 films that Mexican director Alfonso Cuaron and his jury will consider for the festival's top prize, the Golden Lion. Tragic and transformative real-life events loom large in the festival's strong slate of documentaries. Zhao Liang's Golden Lion contender "Behemoth'' shows giant mines gouging the Chinese steppe, while Evgeny Afineevsky's "Winter On Fire'' charts the mass demonstrations that toppled Ukraine's government in 2014. Amy Berg's "Janis'' traces the short, sensational life of singer Janis Joplin, while aerial-photography master Yann Arthus-Bertrand celebrates humanity in the kaleidoscopic "Human,'' which has premieres in Venice and at the United Nations in New York on Sept. 12. Netflix plans to release the African child-soldier drama simultaneously on-demand and in cinemas in October, a development that has alarmed distributors and movie theater owners. Venice director Alberto Barbera is unapologetic about including it. He says cinema is undergoing "seismic shifts'' and film festivals have to reflect them.